"My next call is to ICE to have each one of them kicked out of my country"
A Manhattan lawyer buying lunch at a Midtown cafe threatened to call immigration enforcement on its workers — all because he heard them speaking Spanish. 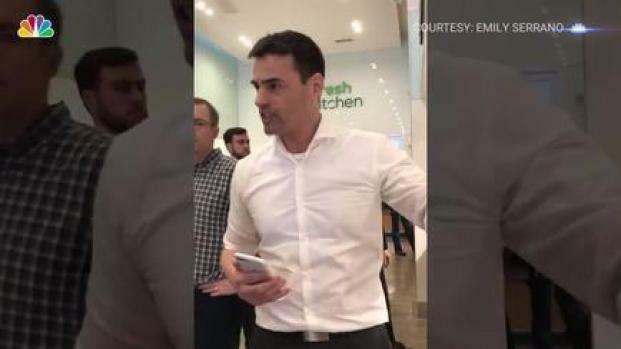 The man's rant was caught on video by a fellow customer, and has since had more than 1.5 million views online. Office manager Emily Serrano said she was at the new sandwich shop Fresh Kitchen at Madison Avenue between 39th and 40th Tuesday when the incident unfolded. She said she was speaking with her server — who speaks both Spanish and English — in Spanish, when she heard a man yelling next to her. "He's screaming at the guy serving him, 'Give me my f***ing sandwich, you shouldn't be speaking Spanish, I feel disrespected, go back to your country,'" Serrano said. NBC 4 cannot independently verify what happened before or after the video Serrano shot. She said she then looked at the man and told him he was ignorant, to which he replied that he was much more intelligent than her. She said she told him he might be more "book smart" than her, but he was still being rude. It was at that point she asked for the manager and started filming. On tape, a man in a white shirt is seen ranting to the manager of the store. "Your staff are speaking Spanish to customers when they should be speaking English...every person I listen to...this is America!" he says. Speaking about the Fresh Kitchen staff he goes on to say he guesses they're not documented. "So my next call is to ICE to have each one of them kicked out of my country. If they have the balls to come here and live off my money, I pay for their welfare, I pay for their ability to be here the least they can do is speak English," he says. "If you intend on running a place in midtown Manhattan your staff should be should speak English." Serrano then gets into a yelling fight with the man, where he tells her to take a break from food and and she tells him he should get hit by a car. "I just reached my breaking point," she explained. After the video stops rolling, Serrano said the man "threw his sandwich in the area where they have the bananas." He again threatened to call ICE and told her to, "Go back to Guatemala." Serrano is of Puerto Rican descent, born in New York. At that point she decided to call police. While on the phone to the dispatcher, the man left, she said. 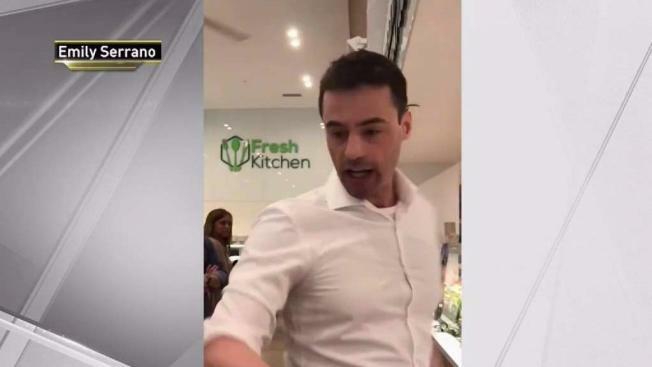 A spokesperson for Fresh Kitchen said the staff were "in awe" of what happened. They said the cafe welcomes people from all cultures, and that everyone has a mind of their own. "But in public area, disturbing others or making comments like that is not right at all." 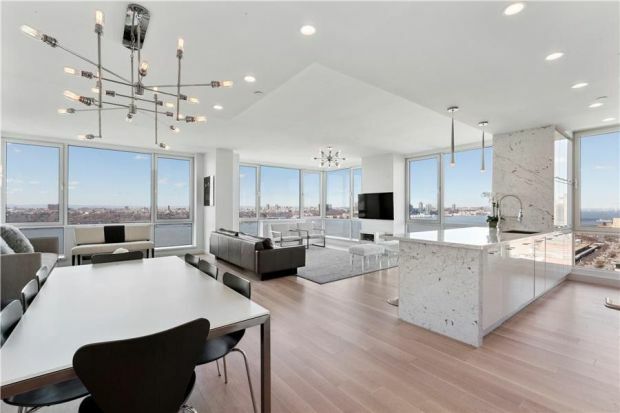 The man in the video has been identified as a New York lawyer, with offices nearby Fresh Kitchen on Madison Avenue. NBC 4 has left multiple messages with the man and the firm seeking comment on the incident. The New York State Bar Association said it was aware of the "situation" with the possible attorney: "He is not a current member of our voluntary association. We also do not handle attorney discipline."